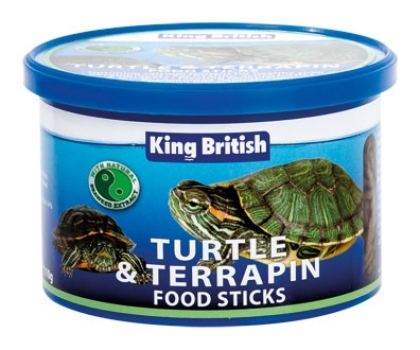 King British Turtle and Terrapin Food Sticks 110g | Livefood UK Ltd. Contains Spirulina algae & Shrimp Shell Meal to provide natural colour enhancement, and high calcium levels for good carapace and bone development. Feeding Guide: Feed 2 to 3 times daily sufficient to last approximately 10 minutes per feed. Do not overfeed and remove any uneaten food. It is advisable to supplement the diet of older turtles and terrapins with green vegetables.paringly twice daily.